Scrap metal recycling companies hold the standard for protecting the environment through responsible practices. Ferrous Processing & Trading is proud of the part it plays helping to protect our environment. As the fifth-largest scrap metal recycling company in the United States, Ferrous Processing & Trading plays an important role in setting the standard for the industry. The U.S. scrap recycling industry is one of the leading scrap recycling industries in the world, providing recycled metal to many countries across the world. AS such, the U.S. scrap metal recycling industry plays an important role in environmental protection including natural resource conservation. According to the Institute of Scrap Recycling Industries, Inc, over 135 million metric tons of materials were recycled in 2011. This work helped to create new material from old scrap metal which can be used to create new products. By working with recycled scrap materials, manufacturers help preserve natural resources. This also saves energy and reduces emissions. All of these actions help to protect our environment. Ferrous Processing & Trading accepts scrap metal to be processed into recycled metal which can then be sold to industrial manufacturers to be used in new products. Ferrous Processing & Trading is dedicated to delivering high-quality metal scrap and maintaining strong business relationships founded on integrity and quality. In addition to creating high-quality recycled scrap material for manufacturers, scrap metal recycling companies like Ferrous Processing & Trading also help stimulate local economies. Scrap metal recycling companies serve individuals and businesses in their local region and also work with manufacturers and buyers across the country and throughout the world. This encourages environmentally sustainable practices that help reduce energy use and waste. The reason scrap metal recycling reduces energy consumption is because it requires significantly less energy to recycle metal than to mine virgin ore. 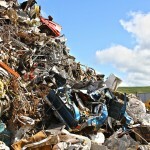 Recycling scrap metal also reduces greenhouse gas emissions. Manufacturers are able to use the recycled metal in the same way they would use new metals. The savings are passed on to consumers and support a more sustainable product life cycle. Scrap metal recycling companies like Ferrous Processing & Trading take their work seriously. As stewards of the Earth, scrap metal recycling companies are proud of the green practices they support and encourage individuals and companies across the United States to take a second look at ways they can increase their recycling efforts.